Steven (Chicagoland, United States) on 14 November 2012 in Landscape & Rural and Portfolio. The Mugu Rock is a distinctive feature of the coastal headland promontory that has been featured in many film shoots and television commercials. 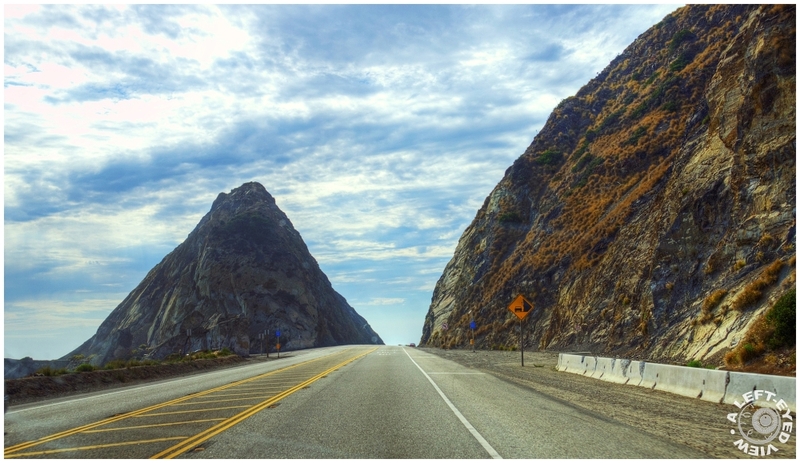 Mugu Rock was formed when a path for the Pacific Coast Highway was cut through the mountain. It marks a western end of the Santa Monica Mountains, and the old Rancho Guadalasca boundary. It is a popular but dangerous place for fishing, sightseeing, cliff diving, and rock climbing up the sheer sides of the rock itself. Photo captured August 16, 2012. Excellent perspective.. Thanks for the info.. now I am trying to find the film..
A marvelous capture of the Rock with a fabulous perspective. The Rock stands out beautifully against the sky. Incredible perspective - your composition is also very cinematic! Super Perspektive, Licht und Farben. Interesting that they cut the rock away rather than cutting a tunnel through the rock. Maybe because of earthquake possibilities? I wonder about falling rocks in a situation like this. You captured it well and perhaps from the driver's seat??? @Judy aka L@dybug: There were many points along the Pacific Coast Highway where the rocks and boulders seemed to be looming over our heads. Many areas had wire mesh screening to prevent rock slides as well. I was in the passenger's seat during this shot. Tomorrow's photo is from the other side and will show how the mountain was gouged out. Very nice shot with great texture and tones. I find it fascinating to navigate roads which have literally been carved out of rock. The planning that goes into them is remarkable. Very well seen and captured ! Excellent POV that creates an impacting composition. Very beautiful light. WOnderful POV. THe rock certainly is a lovely graphic. Great view and dramatic rock with the road sliced right through! A strange and wonderful formation. A great find and photo. Impressive place! Great capture of it from this point of view. Wonderful perspective! Really interesting information about this rock. It looks like it would be quite a challenge to climb. I like the rugged texture of the rocks and the delicate clouds against the light blue sky. Yes, I can imagine the impulse to climb . . and the consequences. Dramatic and photogenic, for sure. Excellent road picture.